#110 - here we go! This is the autobiography of the first African American First Lady, Michelle Obama. 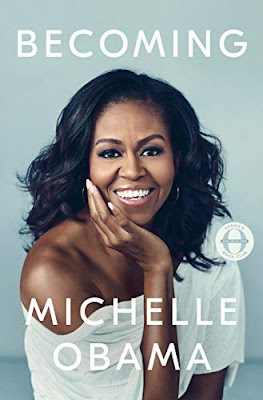 The story covers her life - from growing up on the South Side of Chicago in a poor, yet loving, family - to becoming the First Lady. She discusses with warmth what it was like growing up in Chicago, going to Princeton and Harvard Law school, meeting Barack, becoming a mother, and finally going to the White House. She became an advocate for young girls and women all over the world. She gives readers a candid look into her life. This was a great book. Mrs. Obama writes with grace and intellect and even humor. You get to find out how she really felt about Barack running for public office and then finally running for President of the United States. You get an indepth look at her childhood and the love she had for her family. She talks candidly about how it was to protect her daughters from the limelight and the struggle to give them a normal childhood. How she wanted nothing else to be an advocate, a role model, a good mother and a loving wife and what it took to try and have it all. I encourage you to read this book. I enjoyed every page. Well, until I got to the end and we started to creap to 2016 - the end of their term in the White House - and I felt my chest tighten. She talks shortly about what it was like to hand over the reins to Donald Trump and how she felt about the change that would happen, but mostly she sticks with her ultimate message. For every door that is opened for you, open a door for others. Invite one another in. Don't let the hate and the fear that has ruled our country for the last two years be what we become.